I pull a battered blue folder off my shelf. In marker, I have printed “FIRST MONDAY FIRST PERSON” on the cover. I open that battered blue folder and look for my notes from our August meeting, the one where the small miracle occurred. From time to time, because I create spaces for reminiscence writers to come together, I see small miracles: The one where someone makes peace with an old life experience. The one where a friendship forms, often at a stage in life when we lose more friends than we make. The one where, like this time, one person’s story helps heal another person’s grieving heart, just a little but just enough. In the meeting room at the Goodman South Madison Library, thirteen of us gathered, greeted, filled our little plates with snacks, then settled in a semi-circle around the podium. Some were regulars, some just occasional drop-ins to First Monday First Person. One by one, writers who had added their name to the readers’ list stepped forward. We listened to their stories about a death, a birth, a tribute to a dad, a bad choice, a happy childhood—memories good and bad, memories worthy of reflection. Here is the piece Sariah read. 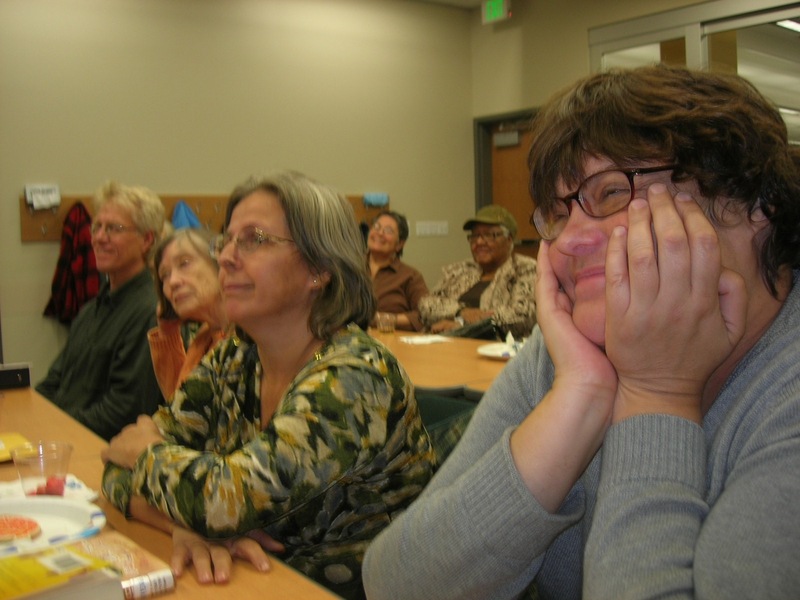 Not that night, but one like it…enthralled listeners. Another reader, another round of applause, and then the librarians flashed the lights, signaling time to close. For me, a big part of the motivation to host workshops and events like First Monday First Person is to create a place where we can help each other figure out how to live, from the writing we share and the talking we do. These moments are what I’m working toward, with every phone call and email about the logistics and the honoraria and the registrations and all that nitty-gritty stuff that goes into being a writing instructor at large. As I gathered up the remnants from the snack table that evening, I noticed that Mary Joan had approached Sariah—the two were talking near the door. As I headed out into the summer twilight, I saw them in the parking lot still talking, car keys in their hands. I pulled away with a heart happy for the small miracle of one person being able to offer comfort to another. at Capitol Lakes, starting next Tuesday. Find the nitty-gritty here.